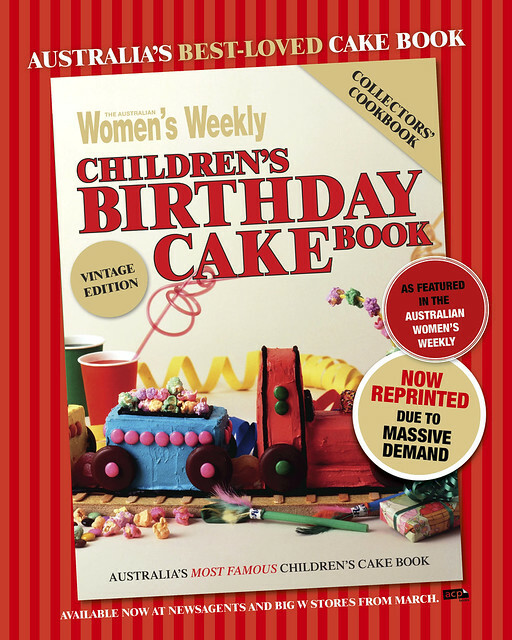 melbourne gastronome: The Australian Women's Weekly Children's Birthday Cake Book (Vintage Edition): Back by popular demand! Woohoo! I'm not even going to pretend that I have kids to buy this for. 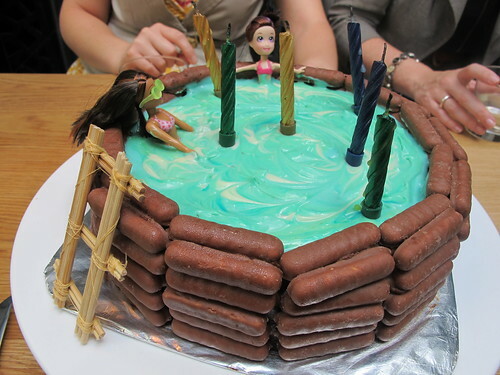 My mum made lots of these cakes for my brother and I, my favourite being the swimming pool cake you mentioned - it looked *exactly* like the picture. Other triumphs were a Mr Happy cake and a Frankenstein cake. Hmm, maybe it's my turn to bake for my mum. A patchwork cake perhaps?? 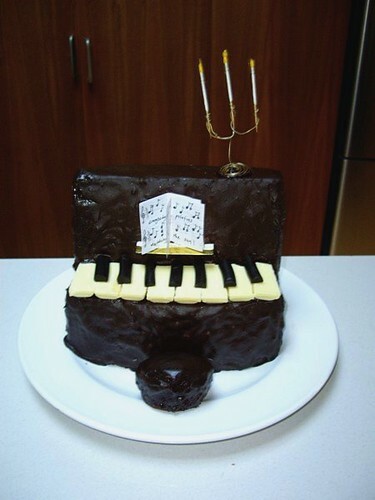 I have been unindated with requests for cakes recently. I have made the Sweet Shop and the Stove in just the last couple of weeks! They are making a huge comeback! 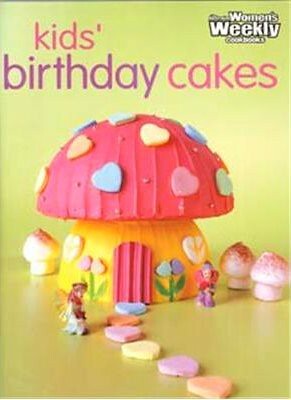 My mother always whipped this book out a month before our birthdays and asked us to pick which one we wanted. I had the sewing basket, the barbie, the log cabin and many more. They were all so beautiful to look at and delicious. I have my mother's copy from the early 80's but I will be buying the new edition when it comes out. The other one has bits of cake on it! I had the train for my 5th birthday. ChooWooO!! I never had one of these cakes as a child but the giraffe cake holds a special meaning for you - as you will know by my avatar! 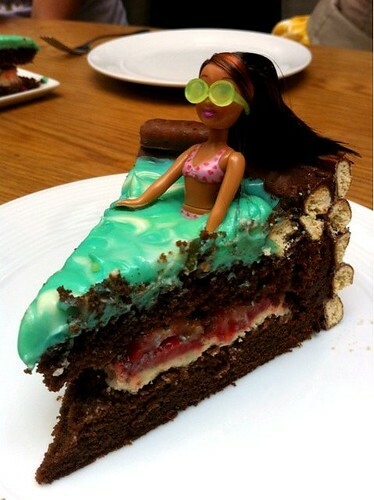 I love your cakes - now I want to make the updated pool - just brilliant. Am glad the book is reprinted because I'd heard that prices on e-bay were getting silly and everyone should have this book - though the cyncial voice in my head says AWW just wanted to cash in on the popularity of it rather than it going to ebay owners!!! SHUT UP!!!!! 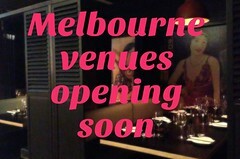 THIS IS THE BEST NEWS EVER!!! I am obsessed with this book (I made the pool recently, which is the only cake mum ever made me. The jelly cake thing was a bit wrong). Heeeee! What awesome news to start the week! I won't have to borrow Mum's anymore. I made the train cake in November (EPIC - but worth it) and I'm due for a Ghost Cake in May. If my mum had her way she'd ban this book. She still made me the Train and Aeroplane cakes. The train was always a winner and Mum made the piano for me one year as well. Mum found a copy of the book for me at a market a couple of years ago but I haven't made anything yet - my daughter is 2 and this year I made her a 'Hoot' cake. (Owl character from ABC2)You have inspired me to get it out and have another look! Ok. Confession time. 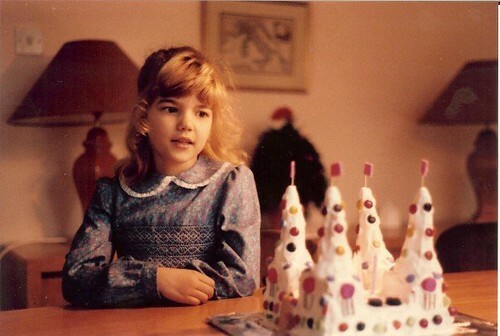 I had the Jelly pool cake from my I believe my 7th Birthday onwards. 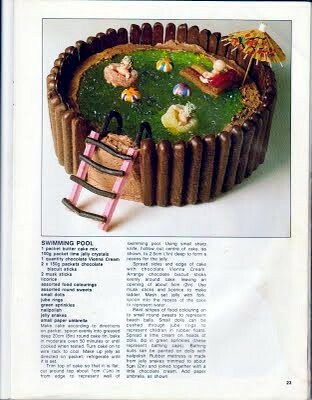 Every year my poor mum would pass me the greatest cake book ever printed to which I'd reply.. no need the pool cake please. After about 5 or 6 years she stupidly threatened me with this ..."if you get a jelly pool cake one more time when you are 18 I will get you a real jelly pool and I'll make you jump in it".. Guess what on my 18th I had an inflatable pool full of jelly. Fun times. 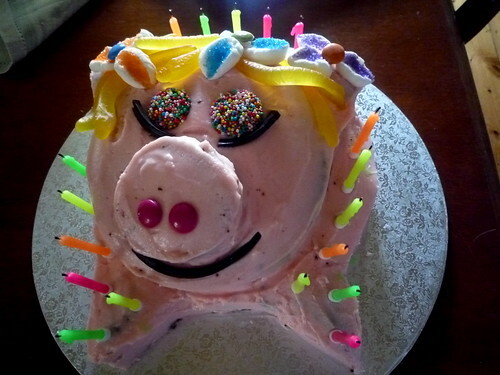 I am now 28 and last year I had a Jelly pool cake for my birthday. My theory is this. Not only do I get cake, but I get jelly and always ice cream. Dessert bonanza!Plus Kit Kats make a great fence! omg this post is so cute :). I have heard a lot of things about this book, and how a lot of Aussies grew up with it! This is great news - even though I've got an original copy (and the sacrilegious new version), I need a new one to replace the pages that are glued together with cake. I've also been meaning to make the evil duck cake, possible with red, glowing LED eyes. There is truly something malevolent about the combination of bow tie and popcorn afro. Does anyone know which 4 cake designs are missing from the new version that were in the old? Oh, so this is why they're advertising the supplement of this book with this month's WW!! Wonderful news! 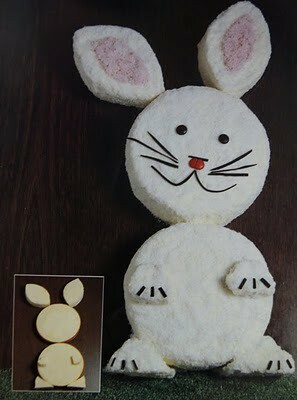 My mum made me the bunny when I was 4 :) I also had the Elephant, Minnie Mouse and the little Vanity Unit. 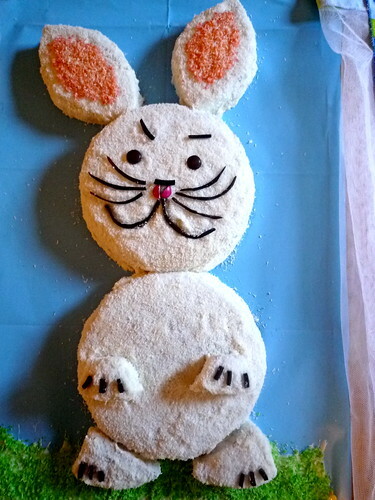 My sister had the Castle Cake, Dolly Varden, Little Miss Muffet, Humpty and the Teddy Bear. Unfortunately we lost our book to a naughty relative so I think I'll have to get 2 copies, one for myself and one for mum! The four missing cakes must have infringed intellectual property and I assume the licensing fees too expensive to include them in reprints so Minnie Mouse had to go. I can't remember the others from memory. Was there also a Donald Duck? So funny, we were just talking about the WOmen's Weekly birthday cakes at work yesterday, and then I stumbled upon your blog entry just now! 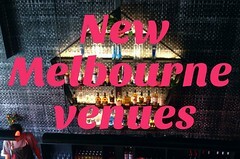 Lovely blog - so great to read about Melbourne restaurants! OH MY GOD. 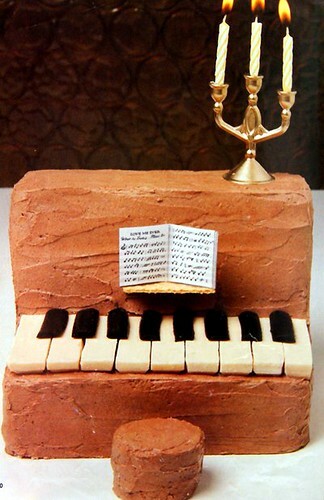 I'm not sure what is better; the cakes you've had made for you or the fact they're reissuing that book. I had the dump truck for my 5th birthday, the one with mint slices for wheels. My sister asked for the castle one year and I remember seeing my mum sobbing in the kitchen at 4 am when it all fell apart. Oh, the memories. But the black notes on the piano are all wrong. They are supposed to be in sets of 3, then 2, then 3, etc with gaps in between. My Dad turned the big 60 a few years back, & always had great yarns to tell us about the Steam Trains he used to admire & watch as a youngster. My younger sister & I were given the honour of making the cake for his Birthday Party, & we got together to discuss what we'd make, at Mum & Dad's place. Of course, you can easily guess what we grabbed 1st from Mum's Cookbook collection, & the cake we chose to make! Choo choo! We filled the Train with licorice Allsorts (Dad's favourite lollies) instead of popcorn. What a triumph it was!! We got huge 'oohs & ahhhs' from the crowd of guests, & Dad was blown away :) Thanks Women's Weekly for reissuing this vintage cookbook. So many precious fond memories! One of my favourite books of all time, I have the old and the new and they've both been dog-eared beyond recognition!! Oh my, I wish I'd seen this before paying $49 for a used copy on eBay! My daughter nagged me constantly for giving my original copy to a friend whose children were still young whilst mine were teenagers. So I tried to get one for her on eBay not realising just how expensive it would be. I believe the original was only $6.99! However she is now making good use of the eBay copy following the same tradition I started with her & my son I.e. the book came out with great ceremony a week before the party so they could choose 2 cakes, one for the party & one to share at school. They spent hours looking through the book. I'm yet another obsessor when it comes to this book. 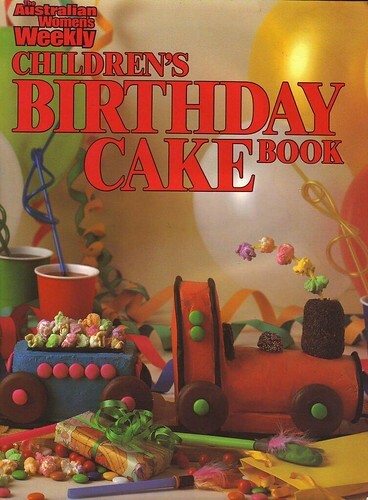 I actually bought the Kids Birthday Cakes book for a family member when it first came out. It was a great book with easy to follow instructions and great cake ideas.